PTU Exam 2019: I.K. Gujral Punjab Technical University (IKGPTU), formerly Punjab Technical University (PTU), is a State University located in Jalandhar, India. It was established by an act of State Legislature on 16 January 1997, to promote technical, management and pharmaceutical education in the state of Punjab at the degree level and above. At present University have 121 AICTE and 65 UGC institutes affiliated with it. IKGPTU holds the PTU Exam for offering admission in various UG and PG courses every year. Punjab Technical University Exam will be conducted this year also in the month of July by IKPTU. The University will conduct the centralized counseling for providing admission in B.Tech, B.Arch, M.Arch, M.Tech, B. Pharma, B. Urban Planning courses and entrance exam for MBA, M.Sc, MA courses. The authority of PTU will announce the key dates of PTU exam and Counselling process very soon. Here is the tentative schedule of PTU. 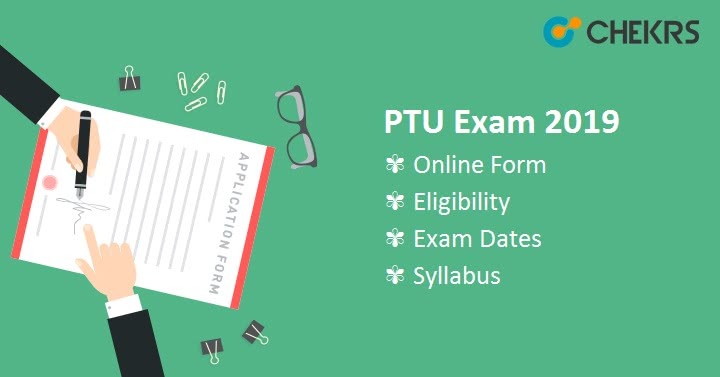 Check the PTU 2019 Exam Date and admission date for the entrance exam and counseling process. PTU Eligibility Criteria will be different for all courses. The authority of PTU will decide the eligibility criteria of PTU exam or eligibility for counselling process in PTU. It will be necessary to meet all the criteria. For more details, you can check the official website and download the information brochure from there. Here, we have mentioned the PTU Entrance 2019 Eligibility Criteria in brief. Please go through it before applying for application form or counselling process. Candidate should pass 10+2 with PCM or PCB stream//Diploma for UG course. Appearing student can also apply. Must appear in JEE 2019 Exam or NATA 2019 exam for direct admission in B.Tech/B.Arch. For M.Tech students, GATE score will be required. For MBA/M.Sc./MA, must score minimum marks in PTU Exam. CMAT score can be considered for MBA only. PTU 2019 Application Form/ admission counselling form for academic session 2019-2020 will commence in May 2019. PTU will provide admission in B.Tech course on the basis of JEE scorecard and for B.Arch, NATA score card will be required. The University will conduct entrance exam to provide admission in MBA, M.Sc or MA courses. Candidates can check the information regarding admission process and PTU Registration on the official website of PTU. The university will release PTU 2019 Application Form on the portal of IKPTU i.e. ptu.ac.in through online mode. For B.Tech/B.Arch/M.Tech/M.Arch course, the candidate will have to pay the PTU Counselling Fee first and then fill the admission counselling form along with stream and their choice of college. For PTU entrance exam, the candidate will have to fill the application form and then pay the fee through online mode only. The application fee for centralized online counselling process will be Rs.2000/-.It will non-refundable. The application fee for entrance exam will be Rs.500/- (Rs.250/- for SC/ST). The PTU authority will release PTU Exam Result for MBA, M.Sc, MA in July as expected date. No entrance exam will be conducted for B.Tech/B.Arch/M.Tech/M.Arch course. Admission will be done on the basis of JEE Main and NATA score. The candidate who will apply for counselling can check their merit list or seat allotment list from the official website of PTU. Students can also check the PTU 2018 entrance exam result from the official website. IKGPTU will conduct the centralized online PTU Counselling process for admission to the various courses. Counselling will start from July onward for MBA/M.Sc/MA and for B.Tech/ B.Arch/ M.Tech/ M.Arch course, it will start in the month of May. The counselling will be based on inter-se-merit of 10+2/ equivalent exam, JEE score, NATA score.